Donald Trump has left the White House. For 17 days. For a vacation in New Jersey. Is it safe to come out? Initially, I thought so. After Senators John McCain, Susan Collins and Lisa Murkowski stood tall to defeat a miserable “skinny” bill to repeal the Affordable Care Act, I was encouraged that bipartisan efforts seemed underway to fix Obamacare. (GOP Senator Lamar Alexander and Democrat Patty Murray are collaborating to stabilize the insurance market. Parallel efforts are underway in the House to protect subsidies.) I was also encouraged that Iowa Republican Chuck Grassley and others were warning President Trump that they would not entertain any new nominee for Attorney General to replace Jeff Sessions. A bipartisan group in the House is working on climate change. Like Noah’s Ark, each pair of Representatives joining must include one Republican and one Democrat. Such initiatives are in line with McCain’s clarion call to ignore the bombast of the talking heads and to return to “return to the old order” of legislating in the Senate, with public hearings and both sides contributing to the debate. “What do we have to lose by working together?” he had asked of both Republicans and Democrats. I allowed myself to wonder: could we be moving out of the dystopic world of Donald Trump? Would it were so. But, alas, yesterday’s “fire and fury” threat by Trump, promising to unleash against North Korea “power the likes of which this world has never seen before,” was scary as hell, even, I suspect, to his aides. Secretary of State Rex Tillerson defended the President’s language as a strong message to a country that doesn’t understand the language of diplomacy, but Tillerson also tried to dial it back, insisting we are not on the precipice of nuclear armageddon. He tried to reassure the American people that they can sleep at night, even advising people explicitly to disregard the rhetoric of the past few days. There is, he said, still room for negotiation. But the President’s ignorance about nuclear weaponry and warfare is jaw-dropping. Unfortunately, the leaders of North Korea and the United States share certain qualities that pose a threat to peace. They are both bullies, impetuous and heedless of the long-term consequences of their testosterone-laden words and actions. 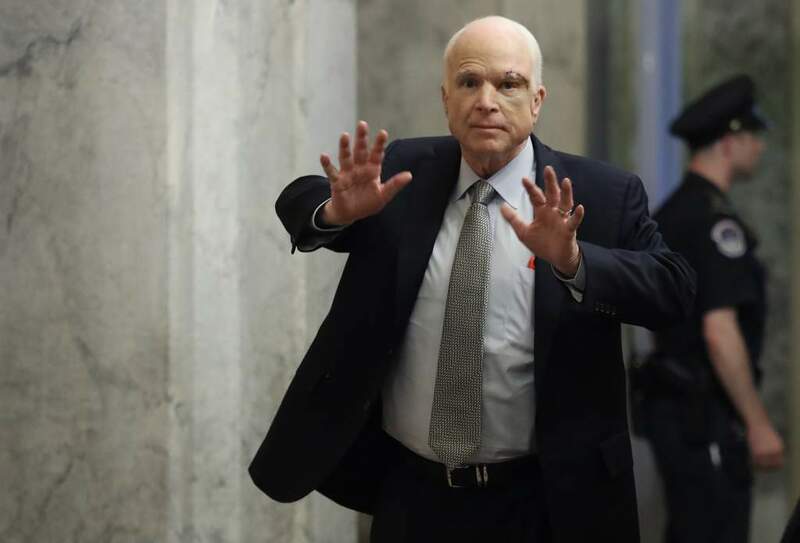 At this point, we might find solace in John McCain’s reminder that the Senate represents “a check on the power of the executive.” “We are not,” he said in his inspirational speech on returning to Washington after brain surgery, “the President’s subordinates. We are his equals.” One can only hope that, notwithstanding the GOP’s increasing internecine fighting, there are enough like-minded colleagues willing to resist Donald Trump’s bullying and blandishments and to fulfill their Constitutional obligations as a deliberative body in the interest of the American people. Without their standing up, it most definitely is not safe to come out. This entry was posted in Uncategorized and tagged bipartisanship in Washington, Chuck Grassley, climate caucus, defeat of Obamacare skinny repeal, Donald Trump warning to North Korea, John McCain, lamar alexander, Lisa Murkowski, Patty Murray, Secretary of State Rex Tillerson, Susan Collins. Bookmark the permalink. 2 Responses to Can bipartisanship keep Trump at bay? Popcorn! Peanuts! Cracker Jacks! Debacle. Unfortunately, while Trump’s rhetoric may be intemperate, the naive diplomatic initiatives of Presidents Bush I, Clinton, Bush II, & Obama who thought they could deal with North Korea have led us to where we are today with no good alternatives when more forceful action earlier could have forestalled the current no-win situation of an irrational nuclear armed North Korea.